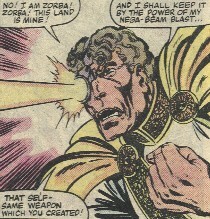 Powers/Abilities: Zorba wore a cybernetic eye to replace his lost organic right one. He could fire a "nega-beam blast" from this eye. He had some experience with combat and paramilitary strategy. (Astonishing Tales#1/2 (fb) - BTS) - Zorba was presumably a prince of Latveria when the previous royal family was ousted by Doom. (Books of Doom#6 (fb) - BTS) - As Doom's forces approached, King Vladimir had his sons Rudolfo & Zorba brought before him and then sent away via his two fastest horsemen so they would escape Doom. (Fantastic Four I#198(fb) - BTS/Fantastic Four Annual#15(fb)) - Zorba was captured by Doom, who had his minion, Gustav Hauptmann, experiment on the prince's eyes. Hauptmann replaced his right eye with a cybernetic eye. (Fantastic Four I#198 (fb) - BTS) - With the death of his elder brother, Rudolfo, Zorba took over the role of leadership of the Latverian Underground/Freedom Fighters. (Fantastic Four I#198) - Reed Richards sought to assault Doom's Latverian castle, but his ship was shot down and he crashed into a small body of water. Reed was recovered by Zorba's men (now numbering only 50) and Zorba revealed Doom's plot and convinced Reed to join him in an effort to depose Doom. Reed's powers helped Zorba and a small group of Freedom Fighters to approach the Castle seemingly undetected, gain entrance to its interior, and take out several guards. The others were then dropped with a gas attack, but Reed managed to pull Zorba to safety. They then ran into Gert Hauptmann--brother to the one who had experimented on Zorba--and they were able to coerce his cooperation. Reed then disguised himself as Hauptmann and approached Doom, who saw through his disguise, knocked him out, and captured him. (Fantastic Four I#199) - Zorba gathered a group of Latverian citizens and demanded an audience with Doom. Zorba intended to reveal Doom's plot to replace himself with a clone to continue his rule of Latveria. Doom fired an energy blast at Zorba, but when the prince led the Underground to aim their weapons at the castle, Doom appeased the crowd by assuring them that he would give up power at the upcoming coronation. Later, at the ceremony, Zorba secretly made his way into the castle, where he managed to free the captured Fantastic Four. 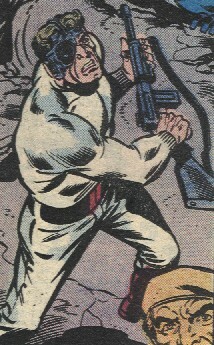 Alongside the Four, Zorba rushed into the ceremony and revealed Doom's successor as a clone. Doom unleashed his Omni-Bots against his foes, but Doom's clone then turned against his progenitor, attacking him. Doom slew his own clone. (Fantastic Four I#200) - Amidst a crowd of gathered citizens, Zorba denounced Doom's plot as a ruse to maintain leadership, and he demanded that Doom surrender the throne. Doom responded with his vortex machine, which scattered his accusers. Zorba escaped and rejoined the Fantastic Four, assisting them in their search for the details of Doom's master plan. Ultimately, the FF defeated Doom, driving him temporarily insane. As a result, Zorba was crowned King of Latveria...until the intended elections in the next month. (Fantastic Four Annual#15 (fb) - BTS) - Zorba was apparently elected to power (see comments). He sought to make changes, but found increasing resistance from the citizenship as he increased taxes to enable these changes..
(Fantastic Four I#247 (fb) - BTS) - Zorba revoked Doom's laws, but also his threats of punishments, and Latveria was reintroduced to crime, as well as poverty and hunger. Prices rose without reason and stocks were depleted without replacement (see comments). (Fantastic Four Annual#15) - A mob gathered to decry Zorba and his tax increases. His advisor, Starn, revealed some of the shortcuts Doom had used, and played the devil's advocate, explaining the things the people missed about Doom's rule. Reacting to some of this advice, Zorba checked on Doom's body--still held in confinement--and found it to have been replaced by a robot. Zorba refused to take his advisor's recommendation to send a spy to infiltrate Doom's Loyalist Underground, instead firing Gert Hauptmann and his staff for their failure. Awakening from nightmares of Doom and his own torture under his hands, Zorba correctly suspected that the Unerground would try to steal Doom's armor. Rather than call his guards, he investigated himself, encountered the rebels, and was incapacitated by them, but not before capturing one of them. Realizing that he had to sink to Doom's level, Zorba sent a man to spy on the Loyalists, and he learned that Doom had regained both his mind and his armor, and that Hauptmann worked for the Loyalists, too. Zorba led a contingent of soldiers to destroy Doom and the Loyalists, but was driven off by Doom's power. (Fantastic Four I#247 (fb) - BTS) - Frustrated by his inability to control the populace and becoming paranoid over the threat of Doom's return, Zorba unleashed Doom's Robot Guards, reprogrammed to serve as his secret police, on the people of Latveria (see comments). (Fantastic Four I#246-BTS, 247) - Doom told the Fantastic Four that Zorba had become a mad tyrant and gained their aid in investigating this. Meanwhile, Zorba oversaw a failed attempt to torture Doom's old ally, Boris, to gain information. When his aid commented that Doom controlled the populace through fear and threat of punishments, Zorba became furious. Resenting their lack of gratitude at his giving them liberty, he decided to give them the ultimate release: death. Zorba unleashed Doom's Killer Robots on Latveria. As the Fantastic Four overcame the robots, Doom confronted Zorba, easily countering his nega-beam blast, stunning the maddened monarch. Doom then grabbed Zorba by the neck, hung him over a balcony, and accused him of treason. Zorba responded that he was the only true heir to the monarchy of Latveria and that as long as he lived, Doom had no claim to the throne. Doom's response? "Precisely." Doom then returned to the Fantastic Four, revealed the conflict to be over and directed the Four to leave his country immediately. See the Rudolfo profile for further discussion on the royal lineage of Latveria, and their other relatives. Zorba mentioned in casual conversation to his advisor that things had gone sour since he had been elected. Kristoff Vernard's mother told the FF that Zorba had declared martial law and "delayed" the elections until certain problems were corrected. The truth is uncertain, but both sides were likely either biased or deliberately misrepresenting the truth. I tried to put the two contrasting accounts together as best I could, but the "truth" is likely somewhere in between. The info from the flashbacks in FF#247 and Annual#15 should be taken with a grain of salt. Doom never directly confirmed that he had killed Zorba, and his death was never shown, but there is really no good reason for Doom not to have killed him.